Women are strong. Our immune systems respond better to trauma than men’s and when we get sick we recover much faster (like you hadn’t noticed). This is because estrogen naturally produces more antibodies to fight off infection whereas testosterone can trip up a man’s immunity and, sometimes, even block it. So next time your guy mews over an infected splinter or a bad cold, before you roll your eyes, remember his biology make him more vulnerable, poor lamb. Of course, some researchers say there’s an obvious reason Mother Nature made women’s bodies stronger in the face of infection: It’s in our species’ best interest to keep females healthy because we’re the ones who produce children and typically take on the bulk of the work raising them. Nothing lasts forever, though. As we get older, a woman’s resilient defenses ebb, or, in some cases, go into overdrive. And our immune system’s armies of antibodies can actually stage a coup, causing chronic inflammation. “This is one of the reasons a lot more women than men develop autoimmune conditions,” says DeLisa Fairweather, an assistant professor at the Johns Hopkins Bloomberg School of Public Health in Baltimore. “These are diseases”—”like lupus,Crohn’s, rheumatoid arthritis, and diabetes”—”where the immune system attacks healthy cells.” In fact, current statistics suggest that women develop almost 80 percent of all inflammation- based autoimmune conditions”—”and that’s a conservative estimate. Women develop almost 80 percent of all inflammation-based autoimmune conditions — and that’s a conservative estimate. Inflammation’s reach doesn’t stop at autoimmune disorders, however. Scientists stumbled upon a eureka moment in the 1980s when they discovered that chronic inflammation was the only common link between cancer, Alzheimer’s, Parkinson’s and heart disease, which is now the number-one killer of Canadian women. For each death from breast cancer, several more women die due to cardiovascular disease,” says Jacques Genest, director of the cardiology division at the McGill University Health Centre in Montreal. What’s surprising is that many of these women, when tested, had normal cholesterol levels. Cardiovascular disease, scientists have realized, is not just a plumbing problem (like blocked arteries), but can also be the result of an internal inflammatory reaction. You may be scratching your head thinking, But, wait, isn’t inflammation a normal part of the body’s healing process? Isn’t that why an ankle swells when it’s sprained or when you cut your finger opening a can of tuna, the skin around it turns red and warm. And yes, you’re right. A healthy body will quickly combat infection or injury by sending pro-inflammatory compounds to the area that make it hurt, swell and feel warm. Think of it as a message from your body that lets you know everything is working as it should. It automatically shuts off when the job is done”–”and the warm feeling disappears, the swelling goes down and you get on with your life. Sometimes, however, the inflammation doesn’t shut off. Chronic inflammation can exist in our bodies without us even knowing. (That’s partly why Time magazine called “the secret killer.”) Unlike say menopause, there are no obvious symptoms, like hot flashes, sweats or cranky outbursts. When researchers describe it as “the fires within” they’re referring to the way inflammatory proteins break down tissues and organs, like a flame turning wood into ashes”—”not to any perceptible changes in body temperature. In other words, chronic inflammation doesn’t usually make you want to jump up and open a window or fan yourself with a magazine. It’s a slow, silent crumbling of organs and deterioration of bodily functions (similar to metal rusting) that occurs when the immune system keeps unleashing inflammatory chemicals into the body. It is caused by things like poor diet, lack of exercise, high stress or a persistent bacterial infection, like gum disease (but more on that later). When inflammation is chronic, many things can happen. Inflammatory chemicals that attack healthy cells in the gut lining year after year can cause lactose and gluten intolerance. When they wash over pancreatic tissue, diabetes may result. When they find their way inside joint tissues, rheumatoid arthritis can kick in. And when they bombard artery linings, it may lead to heart disease. Researchers also think that the brains of Alzheimer’s patients become inflamed”—”what’s referred to as “brain on fire””—”before plaque accumulates between the nerve cells, gradually wiping out the patient’s memory. On the cancer front, studies show that the same hormones that turn up the inflammatory response in our bodies also stimulate cells to divide more frequently and increase malignancy risk. There’s a blood test for chronic inflammation, in case you were wondering. The CRP Blood Test, available through your family doctor, measures C-reactive proteins (CRP) in your blood. CRPs are pro-inflammtory markers produced by the liver in reaction to an inflammatory signal. Normally we have less than 1 mg/L, but when we’re fighting a bacterial infections they can spike as high as 1,000 mg/L. Researchers are most interested in persistent slightly elevated levels (over 1 mg/L) because they indicate chronic inflammation. If a patient is at risk of an inflammatory disease, their doctor may order this test in conjunction with an erythrocyte sedimentation rate (ESR). The CRP is more sensitive and takes time, and using the tests together gives a better indication of the inflammation levels, but won’t reveal exactly where it lies. Fairweather points to statins, an anti-inflammatory cholesterol-lowering drug often prescribed to patients with heart disease. “Right now, these are prescribed more often for men than women,” she says. That’s partly because men typically have a greater risk of coronary heart disease than pre-menopausal women. But while the research is fairly new, statins are now being discussed as a possible treatment for chronic inflammation. And while chronic inflammation in women may start with an unbalanced immune system, it doesn’t stop there. Dramatic changes in our hormone levels during menopause intensify it. Estrogen has a dousing effect on inflammatory chemicals circulating in the body. 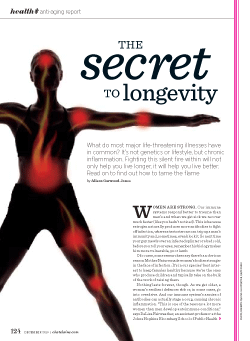 But as we age and the hormone drops off we lose an important gatekeeper in the fight against chronic inflammation. Differences in our bodies and neurobiology also mean that stress cuts a more destructive path in women than men. Cortisol, a stress hormone, plays a direct role in turning up the flame and “women naturally have higher levels of it,” says Fairweather. Add to that our higher rate of sleep disturbances (which have been shown to trigger an inflammatory cascade) and you have two more culprits that are contributing to the growing list of reasons why women’s bodies are simmering in silence. Meanwhile, poor diet and a lack of exercise”—”which aren’t just a woman’s problem”—”can have a huge influence on how inflamed our bodies are on the inside. But a growing number of doctors disagree with this advice. “Aspirin can cause internal bleeding,” says Genest. “And the risk may not outweigh the potential benefits.” Now the focus is on lifestyle, he says. “It’s about healthy food choices, exercise, avoiding smoking and finding ways to lower stress.” It’s been a long time coming, but, finally, traditional medicine is starting to embrace a preventative and more holistic approach to overall health and wellbeing. Our bodies should do exactly what the planet does when the sun goes down, says Naiman. “All of the heat absorbed during the day should dissipate and steadily decrease throughout the night before reaching its lowest point just before the dawn and coming back up,” he says. “Sleep is a release of energy.” Scientists have found, though, that people suffering from sleep disorders don’t get cool enough at night because they’re inflamed. In some cases, their body temperature literally qualifies as a fever state (over 37ºC), says Naiman. • COOL THE ROOM: lower your thermostat at night to around 20ºC. • TURN OFF THE TV: A little TV humour is okay before bed, but avoid being “dramatized” by one-hour police shows or murder mysteries. Save those for a the day, says Naiman. At night you want to create a release of energy, not a build-up. • UNPLUG YOUR BRAIN: Don’t take or make any phone calls or fire off any emails one hour before you sleep. • PREP FOR REST: Use your pre-sleep hour to read a book or practice simple relaxation techniques like meditation and gentle yoga. •SET YOUR ALARM CLOCK: Move your clock to somewhere you can hear it, but not see it. And if your clock has a digital display, ditch it. “Even a small amount of light from clock radios can trickle through closed eyelids, suppressing melatonin production and disrupting sleep,” says Naimain. Have you been burned by love? New evidence shows that stress from personal relationships directly impacts our body’s inflammatory response. In fact, love gone wrong can sometimes be as bad for the body as smoking, obesity and hypertension. And, once again, women are more at risk than men because we produce more of the stress hormone cortisol than they do, and it cuts a more destructive path in our bodies. Recent studies showed that women with lower marital satisfaction experienced a more rapid progression of inflammation-related disorders like carotid atherosclerosis (a vascular disease affecting the arteries to the brain), arthritis and metabolic syndrome, which can lead to heart disease and diabetes. Part of this is because trusting, supportive relationships can inspire health-promoting behaviours, including better eating habits and romantic walks together, while unsupportive relationships can result in cancelled trips to the gym, more sleep disturbances, Häagen-Dazs binges, and higher rates of smoking and drinking. But it’s even more subtle than that: Often, our expectations about the availability and responsiveness of our partner can influence how the body reacts to stress, especially when expectations fall short. This can lead to depression, which studies show make us more vulnerable to infection, fuels inflammatory production and may slow down the healing process. One 2009 from Ohio State University also found that how we love directly affects our immune systems. People who avoid conflict or withhold love (an act dubbed as “attachment avoidance”) have higher levels of inflammation than those who were less evasive. In other words, experiencing your feelings, working through your problems and being open-hearted is better for your body and psyche than bottling up your feelings or pushing someone away. What’s more, when women avoid intimacy their cortisol levels spike — along with their risk of chronic inflammation. “The old ‘Brush your teeth’ should really be ‘Clean your mouth,’” says Howard Tenenbaum, head of research in the Department of Dentistry at Mount Sinai Hospital in Toronto. Ever since a bi-directional link was discovered between gum inflammation and Type 2 diabetes, and, possibly heart disease, periodontists have been sharing patients with endocrinologists and cardiologists. “We now know that treating periodontal disease — swollen and inflamed gums that bleed easily and may have a slightly bluish tinge — can improve the clinical course of diabetes,” says Tenenbaum. So why is a clean mouth so vital to our overall health? “It’s the only area of the body where a structure (the teeth) perforates the skin,” says Tenenbaum. “It’s a week spot and a breeding ground for bacteria.” When gums are diseased they spill a whole array of cytokines into the bloodstream. Flossing and using a soft brush in circular motions along the gum line is key to eliminating bacteria and warding off inflammation, but so is brushing your tongue and sweeping the bristles over the insides of your cheeks. Tenenbaum recommends toothpastes that contain triclosan, an antibacterial ingredient, as well as anti-bacterial rinses. Tenenbaum’s lab is now conducting a clinical trial with a rinse containing resveratrol, a compound in red wine that has been shown to block inflammation. WHAT YOU EAT can determine whether you’re in a pro-inflammatory or anti-inflammatory state, writes lifestyle guru Dr. Andrew Weil, in his book Healthy Aging: A Lifelong Guide to Your Physical and Spiritual Well-Being. Weil, director and founder of the Center for Integrative Medicine at the University of Arizona, suggests stocking up on foods rich in Omega-3s”—”greens, seeds and nuts, and oily, cold-water fish like salmon, sardines and black cod”—”while cutting back on foods high in Omega-6s, found in grain-fed meat and processed foods such as cookies and candy. “Omega- 6s tend to increase inflammation by promoting blood clotting and blood-vessel narrowing,” he says, “while Omega-3s counteract each of these processes.” Weil says correcting Omega imbalances would bring the North American diet in line with the Mediterranean diets, where obesity, heart disease and chronic inflammation rates are lower. Eating low-glycemic foods (or slow digesting carbohydrates) such as yams, wild rice and beans, are also key. Again, our love of high-glycemic carbohydrates, found in cakes, waffles and doughnuts, jump start a process called glycation. It produces pro-inflammatory compounds called advanced glycation end products (AGEs) that lead to oxidative stress, which can do everything from degrading the elastin and collagen in your skin to destroying blood vessels and organs. He also suggests using spices that have potent anti-inflammatory properties, such as turmeric and ginger. Andrew Weil’s Food Pyramid, (below), presents the best food choices and serving suggestions for warding o! chronic inflammation. On the bottom, you’ll find the items you should add most often to your diet, namely red and green veggies and fresh or frozen, coloured berries. This is followed by whole grains, pasta, and beans and legumes, all the way up to red wine and chocolate at the top. For more information on each food item in the pyramid, including how it works to combat chronic inflammation, visit drweil.com. A STUDY published in September confirmed that regular exercise was key in lowering the number of C-reactive proteins in the body, in patients with heart disease, but extreme exercise increase them. Meanwhile, a study from Ohio State University published last January was the first to present clinical evidence of the link between a particular type of yoga practice “—”the gentle Iyengar”—”and lower levels of inflammation. The study involved 50 healthy women, average age 41, half of them yoga experts and the other half with only a few classes under their belts. The novices, the study found, had over 40 percent more inflammatory markers in their bloodstream compared to those who had been working the mat once or twice a week for at least two years. What makes Iyengar so special? The mechanics of the poses and the placement of blocks and bolsters at certain points along the body are very stimulating to the adrenals (the glands above the kidneys in charge of releasing adrenaline and cortisol), says Marlene Mawhinney, president and senior instructor at Yoga Centre Toronto (YCT). Other poses im- prove circulation and pulse rates. YCT offers special classes in Iyengar yoga for people suffering from inflammation-based disorders, including rheumatoid arthritis and heart disease. Mawhinney has even started collaborating with scientists in research trials and presenting evidence of yoga’s medical benefits at conferences. “Doctors today are looking at a wider approach to therapies,” she says. Still, if yoga isn’t for you, any form of exercise will help lower the inflammatory response in your body. The key is to mix it up: combine strength training with cardiovascular activity such as walking, biking or running. And just remember: Don’t overdo it”—”excessive exercise can trigger inflammation too!